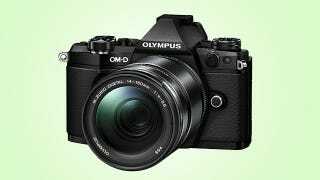 Small, retro, stylish: the Olympus OM-D EM-5 was one of the first mirrorless cameras to charm discerning photographers. The new E-M5 Mark II brings all that back, plus a wild new mode that magically gives you 40 megapixel images from a 16 megapixel sensor. And that's just one of the improvements. The E-M5 Mark II does take on a slightly burlier profile than the original. It's a bit heavier by around 40 grams, and has a slightly thicker grip. The controls were tinkered with, and the display now flips out to the side and rotates. The Mark II borrows some things from the top-tier E-M1, like a terrific 2.36 million dot viewfinder, TruePic VII processor, and a 10 fps burst mode. Unfortunately, it doesn't inherit the E-M1's on-sensor phase detect auto-focus system, so don't expect anything close to DSLR-grade tracking results. Where the Mark II does claim to jump way ahead of its forebears is in video mode. The original E-M5 never had a complete set of video features, and neither did the E-M1 or smaller E-M10. The Mark II adds frame rate options (24, 25, 30, and 60 fps), and a 77 Mb/sec codec that should appeal to those looking for a cleaner, more professional image. A new interface for controlling video settings is also in the mix. With the original E-M5, Olympus debuted a 5-axis image stabilization system which was lauded and mimicked by many. Olympus says it's even better now, compensating for up to 5 stops of shake. Sony's similar system that arrived last year claims 4.5 stops. That's probably not a huge difference in practice, but we'll have to test it out when the camera ships. Now, back to that wild 40 megapixel mode. This is a unique method of creating a super high res image where the sensor shifts left, right, up and down by tiny increments. Eight distinct shots are stitched together for the final image. There's a catch, though: the composite image will be a mess unless your camera's on a tripod. Maximum ISO is limited to 1600 and there's a minimum aperture setting of f/8. So while you might get super-high-res images under the right conditions, don't expect to use the 41 megapixel mode for everyday handheld pictures. One small but neat thing that got me super excited is the new bundled external flash. It's tiny, but swivels up like a proper speedlight for bouncing the light off a ceiling. Nice touch. The OM-D E-M5 Mark II is launching in March for $1100. It's on the expensive side of mirrorless cameras, but Olympus has some die-hard fans, and the upgrades of the Mark II should be enough to empty the pockets of a great many of them.